EVM’s low floor Mercedes-Benz Sprinter conversion’s entry door extends 10cm outside the body, allowing the driver to stop very close to the platform so passengers can board and alight easily. 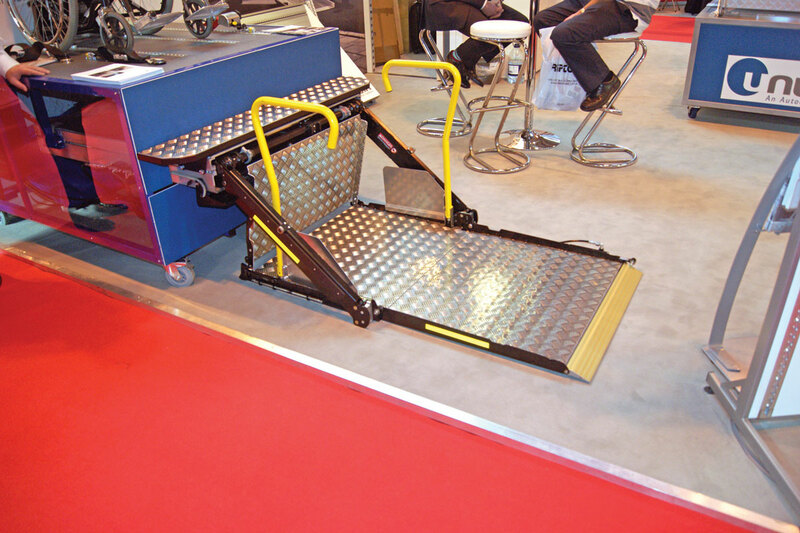 One of Compak Ramps’ NG range of automatic ramps. Being used on a BorderBus double decker is this Trio folding ramp from Portaramp. 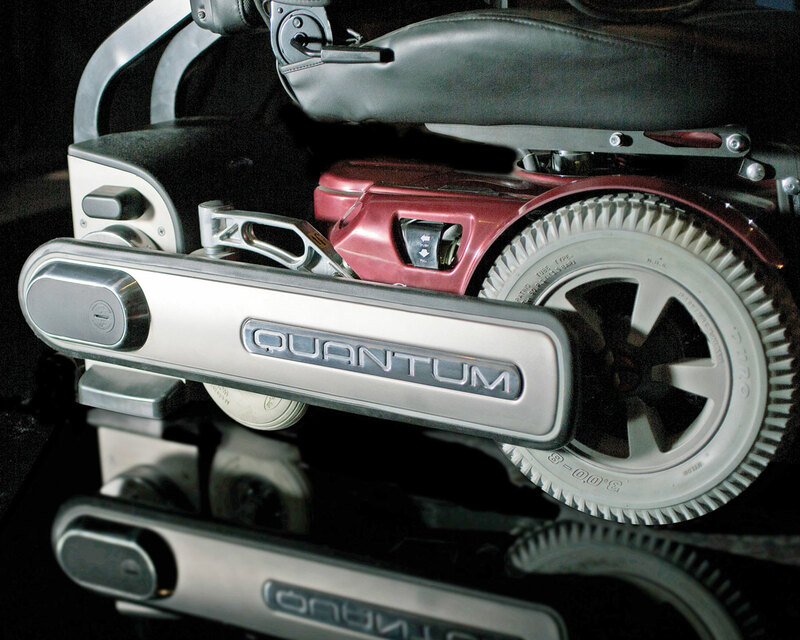 Q’Straint’s Quantum wheelchair securement device. 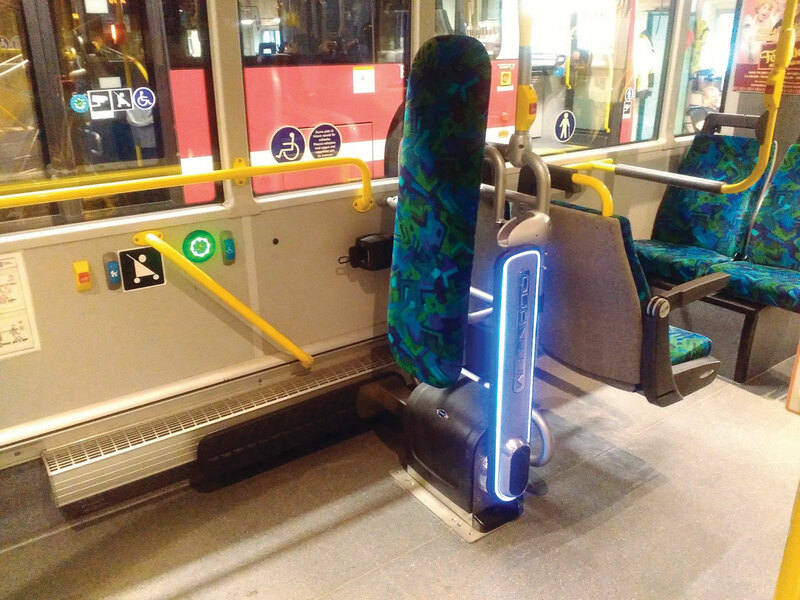 Q’Straint’s Quantum fitted to one of Keoli’s buses in Sweden. Quantum fitted on one of Lothian Buses’ fleet. The BraunAbillity cassette lift from Unwin. Vapor Ricon’s R-Series of ramps are designed to offer economical access for a variety of vehicle types. Regardless of rapidly approaching PSVAR/DDA deadlines that require it, there’s a good case for making buses and coaches even more accessible. However, what needs to be done and how can operators achieve this? Chris Peat has contacted some companies involved in this area to find out what they think and what they can offer. Adam Beck, MD of Passenger Lift Services (PLS), part of the Mobility Networks group of companies, claimed that to make buses and coaches more accessible will involve making the ‘whole package more inclusive and accessible’. This includes working on information, timetables and bus shelters (lift loading areas), as well as training staff in dealing with wheelchair passengers. He said, ‘The Government should harmonise legislation. We currently have BSI, EU, Bus Directive, LOLER, machinery directives, EMC Low Voltage Directives, CE marking… the list goes on! Most of these documents have slight variations and contradictions.’ He claimed that, in general, UK manufacturers adhered rigidly to the legislation, though some others omitted certain items to save costs, commenting, ‘regulations have existed since the 1980s, however many EU (and farther afield) lifts are not built to the same standard as UK lifts in respect of platform sizes, non-slip surfaces, handrail size, safety guards, manual override procedures, etc.’ He believed this had created a two-tier market in which some buyers would fit any lift to ‘tick a box’. PLS’s parent company, Mobility Networks, is a global network of providers of wheelchair and passenger vehicle lifts, ramps and other accessibility equipment. It provides products to meet the needs of M1 and M3 vehicles, including coaches, buses, WAVs (Wheelchair Accessible Vehicles) and PTS (Patient Transfer Service) ambulances. Its access lifts meet all current global safety standards, including PSVAR, DDA and Directive 2001/85/EC. Mobility Networks’ manufacturers are all ISO accredited. Its ramps are hand built from either stainless steel or lightweight aluminum, which it claims results in solutions that are anti-corrosive, strong and easy to handle. You may know them as Ratcliff Palfinger, but the name is gradually being changed to just Palfinger. The company now has a wider range of tail lifts for the bus and coach market than it has ever had, with products from 310kg to 500kg that will be available in all platform sizes. Giovanni Vullo, Head of Sales UK and Export, said the company is in the strongest position ever in regards to tail lifts. One range in particular is doing well, the RTP internally mounted variant. The vertical lifts come with a choice of three platform types, either as vertical split (that splits when stowed for better rear view vision), a one piece or horizontal fold. Suitable for most panel vans and box bodies up to 1,050mm floor height, each is available in a range of dimensions to suit individual requirements. Manufactured in the UK, they have a two year warranty. Demands for high quality basic mobility for all citizens, including persons with a physical impairment, is increasing the importance of wheelchair lifts and other access systems very quickly, according to Dhollandia. The company claims that even though wheelchair lifts are not new, they have been restricted for a long time in lift capacity and feasible applications. The business has invested in recent years to develop heavy duty passenger lifts with increased lifting capacity and a larger platform surface. To demonstrate this investment, Dhollandia exhibited three new passenger lifts at Busworld recently. The cassette lift DH-CH102 raises the functionality and finish up to a new level, according to the company. This lift offers 350kg or 500kg lifting capacity and can be mounted in various positions on a bus. It can be integrated in the lowest step of the access stair, above the wheelbox or on the floor of the luggage compartment. The new DH-RB fold-away passenger lift is usually installed in front of a rear mounted engine. This lift has been fully redesigned and is able to lift 500kg. It has had a number of functional details further optimised, including the roll-stop at the outboard platform edge, the safety rails and the automatic ramp at the inboard platform edge. Dhollandia’s range of linear two-arm lifts DH-PH2 for minibuses has been extended to include a ‘bariatric’ 500kg version suitable for increased lifting heights, with a longer platform of up to 1,600mm to load and unload longer scooters, stretchers and hospital beds. 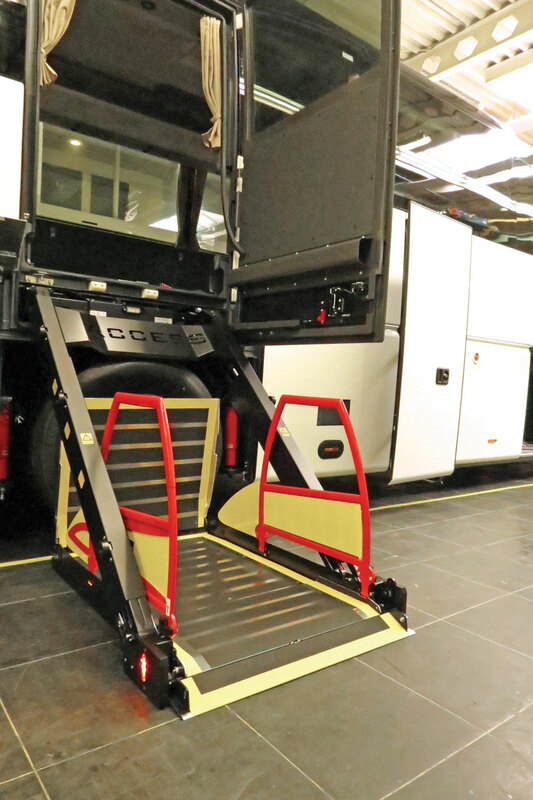 Douglas Park, who handles After Sales for Compak Ramps, says there is already a lot being done in terms of fitting accessible equipment on buses and coaches, particularly when it comes to ramps. He says he has heard there is a lot of focus from disability lobbying groups on the attitudes of drivers (see the two studies covering this issue in B&CB 1355, 27 November 2015). However, Douglas said Compak is continually striving to manufacture ramps that not only meet legal requirements, but which match the ‘spirit of the law’ as well. One area it is looking at in particular is making its ramp even wider to accommodate larger wheelchairs. ‘Compak is doing its best to meet or exceed legislation,’ he said. ‘We are always looking for innovative ways to improve’. It is not just the equipment Compak is focusing on though, as free training in its products is a big part of what the company provides. 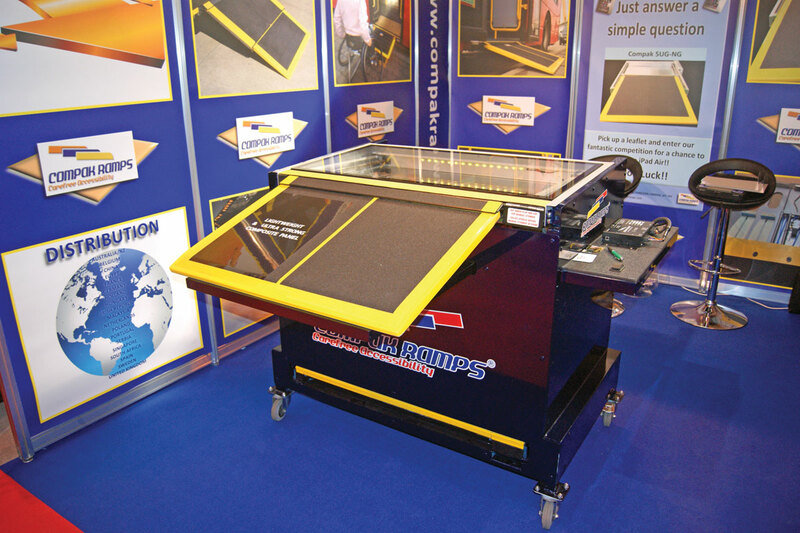 Ramp specialist, Portaramp, has a new solution for boarding buses. Its portable Trio ramp has recently been tailored for one of Beccles based BorderBus’s double deckers. The product’s platform consists of a honeycomb structure sandwiched between layers of aluminium sheets, which creates a strong yet light weight ramp. It folds three ways for easier storage and can be bespoke to any size PCV. 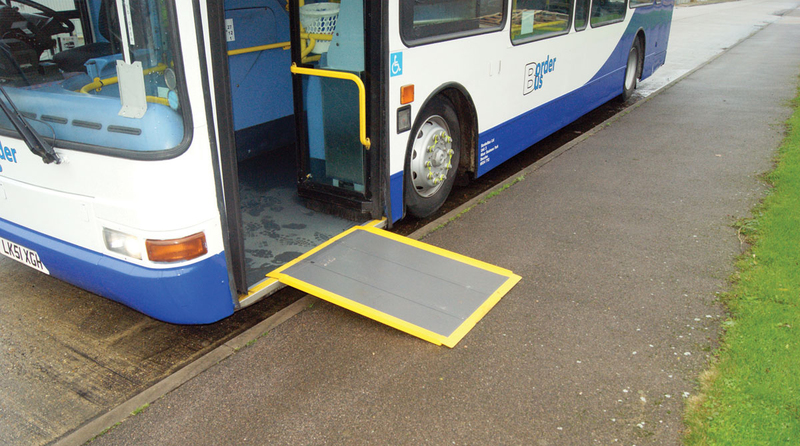 As well as for boarding buses, it is also possible for it to be used off the vehicle to help wheelchair users and other mobility impaired people climb a short set of stairs, for instance, or get up a curb. Andrew Pursey, MD of BorderBus, says he prefers the Trio ramp to the traditional cantilever options, especially as it is comparatively cost effective considering it is an item rarely used. Finding it is DDA certified, he now plans to roll them out across his fleet of double deckers. Somerset based Unwin Safety Systems is pushing ahead with PCV accessibility with its new automatic BraunAbillity cassette lift. The 12v powered device is designed to be a lightweight wheelchair lift that offers the minimum cassette size to the maximum platform dimensions. Weighing 145kg, it is intended to be ideal for minibuses. According to the company, it is easy to install. The product is in addition to a range of other BraunAbillity lift options it has available, including split, telescopic folding and solid platform variants. Aside from passenger lifts, Unwin also provides tailboard ramps for vehicles, as well as its Innotrax flooring system for installing wheelchair bays into a vehicle. The latter is designed to ‘click’ together and can be used in conjunction with its rail products, Easisit seats and seating fixtures. Wheelchair and occupant restraint systems are another product range it provides, including webbing, tie downs and head rests amongst other items. Last year, Unwin became part of a group of companies incorporating Autoadapt, BraunAbility, Bruno Independent Living Aids and Foca-Braun. The move saw Unwin grow its offerings, which now includes BraunAbility lifts, Feal ramps and Revar doors, providing what it describes as ‘a complete solution for your accessible transportation requirements’. Another company with a range of products aimed at solving accessibility issues is Vapor Ricon. The Wabtec owned company can offer door and window solutions, passenger lifts, ramps and restraint systems, all of which are compatible with a host of vehicles ranging from minibuses to buses and coaches. minimum capacity of 350kg and has controls designed to be easy to use as well as built-in magnets for secure closure. Once on board, there is the Handi-Secure restraint system for holding a wheelchair safely in place. When it comes to holding wheelchairs in a safe position on board a vehicle, Koller Engineering has what it claims is ‘the world’s strongest combined wheelchair and passenger restraint’. It sells the Nexxus 200, which has been successfully tested to ISO 10542 to a wheelchair weight limit of 200kg plus passenger harness. It features double rear tie-down straps with specially designed mini lockable rail clips with a double plunger system. Excel compact buckles are attached for strength and flexibility for adjustment and tensioning, whilst high strength karabiners are fitted as standard for maximum safety. The company believes the product will meet the most demanding needs and ensure that almost any wheelchair and passenger can travel in complete safety. An array of other belts, straps and restraints are available from the business. Getting disabled passengers onboard with lifts and ramps is one thing, but what do you do once disabled passengers are on board? There are a wide range of products to ensure wheelchairs stay in place whilst the vehicle moves, but there can be issues surrounding the dignity and comfort of passengers whilst drivers secure them. There can also be problems over keeping to schedule as securing them in place adds further time constraints for drivers. Q’Straint has developed a system to answer these problems: the Quantum. This fully automatic wheelchair securement system is designed to ensure new levels of safety and independence for mobility passengers. It allows wheelchair users to secure their chair quickly and independently. Having already been used in East Yorkshire Motor Services’ fleet, the equipment has now been rolled out at Lothian Buses in Edinburgh. 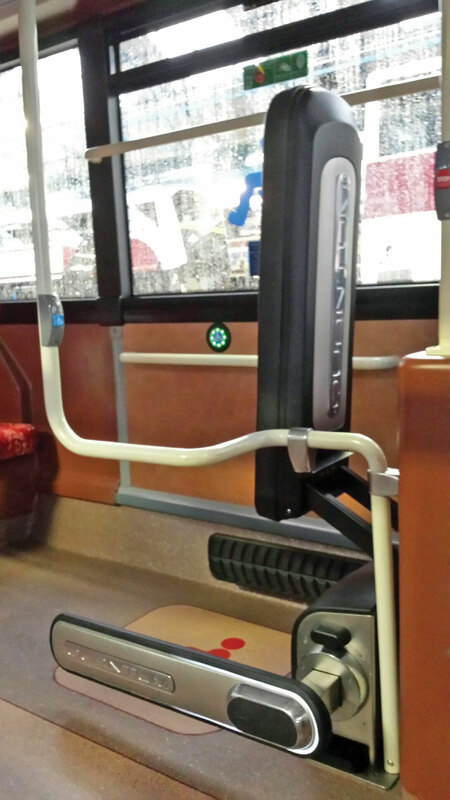 The unit has been installed on a new 2015 Volvo Wrightbus Hybrid and will be servicing a route carrying highly dependent wheelchair users. It has been installed as a complete solution alongside a backrest and Q’Straint designed stanchion pole. The accessible equipment manufacturer also provided Lothian with a driver training program on how to use the Quantum. This particular bus is an ongoing project as technologies and conditions are constantly evolving but it currently features systems such as an induction loop, which is mounted throughout the entire bus so that passengers with a hearing aid can hear important driver announcements. Quantum is the latest equipment fitted to it. Per Larsen said he is ‘delighted with the Quantum product and the installation’. After a training period for the drivers, the bus is to be part of Keolis’ regular fleet in Stockholm. Q’Straint intend to work closely with both Lothian Buses and Keolis to invite various advocacy groups and disability organisations to trial it for themselves, the end goal being to gather invaluable feedback and public perception of the Quantum. A difficulty with carrying wheelchair passengers is that it requires dedicated spaces. This may not be a problem for larger buses, but may well be for minibuses, particularly when operating services carrying a mixture of able bodied and disabled passengers. However, there is a system available designed to create a vehicle with wheelchair spaces without having to remove any seats. This is the RolliBox and a company that can install it is Driffield based Alfred Bekker. RolliBox is supplied by German seating specialist, Schnierle. It features seats that fold away to the vehicle’s side when not in use, making way for wheelchairs. When looking at the system with all seats folded away, it resembles an empty van. A tested, integrated four point tie down system is featured, allowing up to four wheelchairs to be secured. The seatbelts and headrests from the unused seats are used for those wheelchair passengers, allowing for extra protection. When a wheelchair boards, its secure fastening can be aided by floor-level fold-out support arms that are equipped with restraint straps. These arms slide into position in front of and behind the chair and are secured into the floor. The mounted hooks which keep the chair in place are housed on railing to the side of the vehicle when not in use. One of the benefits of using this system is extra vehcle flexibility. It can be fitted to the most common minibus conversions, including Sprinters, Crafters, Movanos, Masters, Transits, Boxers, Ducatos and Relays. According to Schnierle’s website, a future expansion of the equipment for use on buses is currently being discussed, with the system already having worked in coaches. There is a lot of focus on carrying wheelchair passengers, but what about other vulnerable passengers? NMI has designed a solution to ensure safe travel for toddlers weighing up to 18kgs. Sit Safe is suitable for various types and modes of transport. The patented child seat is integrated into the back of a normal bus or coach seat, which when not deployed functions as a passenger seat with a three point belt. Transformed into a child seat by a simple one lever operation, it sees the back of the seat lean forward towards the squab and a smaller seat unfolding from the back of it for the child. It is fully tested to the required regulations, including Regulations R80 and R44, which make it compulsory to use safety belts and child restraint systems in all vehicles in Europe. NMI has a number of seat fixings, seat leg devices, head rests, floor tracking and other solutions for holding wheelchairs in place. Further products that may be of interest are from Crelling Harnesses, which produces a range of seatbelts and harnesses for children and adults with special needs. Its belts and harnesses are designed to offer postural support or for some cases, a certain degree of restraint. It is not just equipment manufacturers that are upping the focus on accessible solutions, converters, dealers and manufacturers are as well. EVM is one of those and it has two products that are most suitable for this. With a maximum seating capacity of 22 mixed between seating/standing/wheelchair, the EVM Sprinter low floor is designed for rural transport. The rapid sliding 120cm entry door extends 10cm outside the body, allowing the driver to stop very close to the platform so passengers can board and alight easily. Multiple drop box combinations are available for luggage storage. The low floor houses both the exhaust and drivetrain to give the Sprinter over 20cm of ground clearance while achieving a low 27cm entry height. The wheelchair area is easy to reach from the wheelchair ramp and features retractable constraints and safety belts. The newest addition to EVM’s range is an M1 Sprinter which can be driven on a car license. It has eight retractable seats that allow up to four wheelchair positions. All EVM’s FiT System Pro wheelchair restraints are built into the completely flat floor and are monitored by sensors, which are displayed at the driver’s position. If something is not secured, a warning light will alert the driver to it. The Iveco Daily conversions it undertakes make popular accessible vehicles according to Barry Selway of Courtside Conversions. The option is particularly popular among those tendering for contract work in Somerset and Devon, local counties for the converter. If not for County Council work, then a well-liked option is the Citroen Relay. Several options are available for the layout of these vehicles and it can convert Mercedes-Benz, Vauxhall, Renault and Volkswagen minibuses too. Unless otherwise specified by the customer, underfloor PLS lifts are used. For in board lifts it often uses Braun or Ricon. With over 20 years experience in converting accessible vehicles, Kent based Euromotive converts a wide array of vehicles, such as the Fiat Ducato, Iveco Daily, Ford Transit, Mercedes-Benz Sprinter and various Volkswagens, Vauxhalls and Renaults. Gowrings Mobility specialises in accessible minibuses, particularly those used for community transport services. Its larger range is based on the Vauxhall Movano, which can carry up to eight passengers and has three wheelchair positions. Nu-Track provides the City Dash, which can be based on a Fiat Ducato or Peugeot Boxer cab on an Al-ko chassis. It has the ability to facilitate up to 16 passengers or up to four wheelchairs. The driveline is available as either manual or automated. The Wrightbus owned manufacturer delivered the very first of these to East Lothian Council recently. A recent development from Stanford Coachworks is its new Stanford Coachworks Essential, a minibus designed to suit lower budget requirements and still retain the converter’s high quality build. Based on the Mercedes-Benz Sprinter, the wheelchair accessible vehicle has no side load door, it has a front entry point into the cab. The rear saloon has 15 Phoenix Sirius passenger seats, 13 of which are removable on NMI legs. All seats are fitted with all age seat belts and padded headrests. For wheelchair access a rear PLS underfloor tail lift has been fitted. A reverse warning bleeper has been wired to the reverse gear and is complete with night facility override. New from Taxi and Bus Conversions (TBC) is a nine seater Volkswagen Crafter CR35 accessible minibus. Its seating is arranged to accommodate up to two wheelchairs and an inboard wheelchair lift is fitted. Additional specifications include floor tracking, four ‘tip and turn’ seats, three quick release seats, trimmed walls and ceiling, additional speakers and roof lights, as well as vinyl non-slip flooring and a wide fully automatic side door entry step. 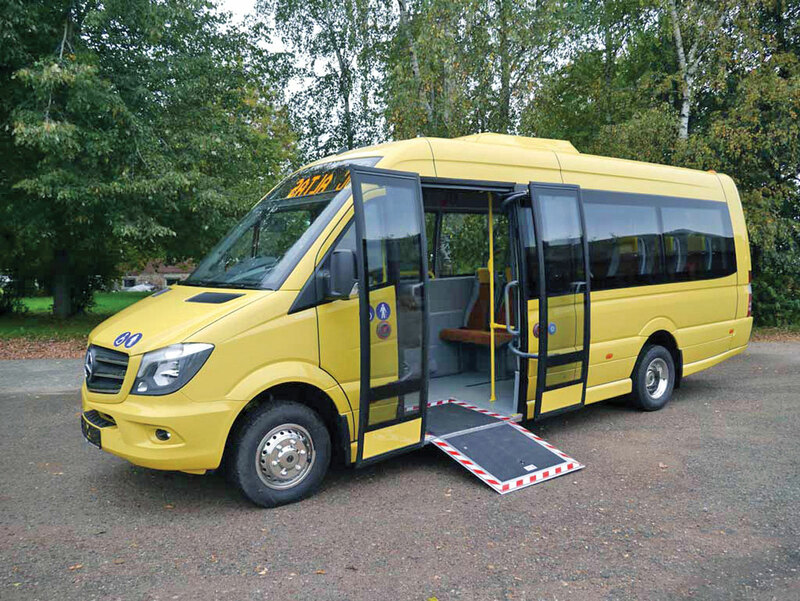 Among Mellor Coachcraft’s recent accessible minibus deliveries is a fleet of 15 Mercedes-Benz 513CDI LWB Sprinters purchased by Wigan Council. The specification includes 14 seats, an easy access stepwell, an extra wide flush fitting fold out step with warning device, a power operated glider in-swing door to the front nearside passenger entrance, a Happich emergency escape, a multi-directional lift up ventilator, an Eberspacher D5L heater, a 400kg capacity wheelchair lift and cant rail tracking.